PRESS RELEASE: Fusion Hats, one of Sabian's most popular cymbal innovations, are now available in the company's Modern Dark series, HHX. Featuring a medium top and a heavy, un-lathed, hand-hammered bottom, Fusion Hats - in 13" and 14" sizes - deliver high-definition sticking, crisp, clear pedal 'chick', and cutting volume in both closed and open positions. 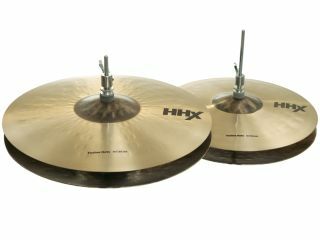 The 'Fusion' part of the name comes from the mix - or fusion - of raw bottom cymbal and lathed top, in this case an HHX top and an HH bottom. Said Sabian Master Product Specialist Mark Love, "Though the name suggests Fusion Hats are for fusion drummers, these hats are great for any style of music requiring crisp sticking and clear penetration. They can be played tight and funky, or they can open up and cut through the loudest rock band." "With an HHX top, these Fusion Hats combine the hot darkness of HHX with the dark but defined cut of the heavy HH bottom, for a crisp blend of tonal darkness. The innovative 'Tone Projection' design of HHX also means these hats project their dark tonality, so drummers wanting darkness in high-volume situation can be heard without excessively hard playing." All HHX cymbals are hand crafted from Sabian B20 bronze castings, and are quality protected by the Two-Year Sabian Warranty.